We have already added Animals mod (link) that adds not only lions but also tigers, pandas and zebras. But this is a mod, not an add-on, when installing it you may have some difficulties due to incompatibility of Blocklauncher or any other rare errors. If you do not want to understand the installation, then download the Lions addon, along with which you will get real lions. 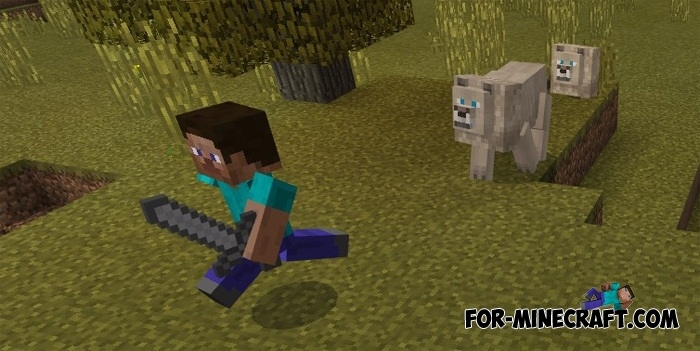 This is one of the most powerful animals and can deal with any creature in Minecraft Pocket Edition. Having met a lion on your way you will have several options. If you are armed and well equipped, then try to enter into battle with it, but if you are empty then run better. During its attack, you will hear sounds that can be pretty frightening. They will spawn everywhere, so take meat for taming. Tamed lion will become your best friend if you play a single player. Your new companion can attack opponents and just live in your home. The only thing is that your lion can not live with other animals such as pigs. Lions will show hunting instincts and eat all your cattle. Lions can multiply after that the baby lions will appear. Feed them with meat to grow a real lion. Hunting addon for MCPE 0.17.0/1.0.2I'm sure many of you would like to hunt different animals..